Enclosed bike lockers are available for short and long-term rental at the Somerville and Raritan rail stations. 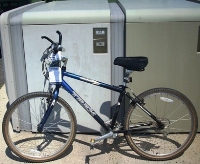 The lockers, sponsored by NJ Transit and administered by RideWise, protect bikes from weather, theft or damage while also eliminating the cost and hassle of parking. The lockers can fit a bike, helmet and some gear. They are available to rent for $8 per month with a $50 refundable key deposit. For additional information, contact staff@ridewise.org or call 908-704-1011.